Tour of Britain report from Mr Giles Ripwell. Giles Ripwell of TEAM wiggins has agreed to write a blog from the Tour of Britain. Stage 1. Beaumaris to Wrexham. Blimey! Here I am at the start of the Tour de of Britain about to commence a cycling competition for Bradley Wiggins-Sir’s TEAM wiggins. The start is in Beaumaris, which means beautiful potato, next to a lovely castle. Crikey! It’s a corker! It was built by a French chap going by the name of Henry Degrange for the start of the 1456 Tour de France and is now a local tourist attraction. The route goes through the north of Whales then… hang on a ruddy well minute, what’s that in the sky?! Mountain Snowdon, that’s what. Often considered to be the highest structure in Whales, this mountain, or mount for short, was built in the 60’s to allow hill walkers to reach the top of the railway line there. Further along the way we will pass Betws-y-Coed and Betws-y-Andreu before finishing in Wrexham where the famous Racehorse Ground still holds international polo matches. 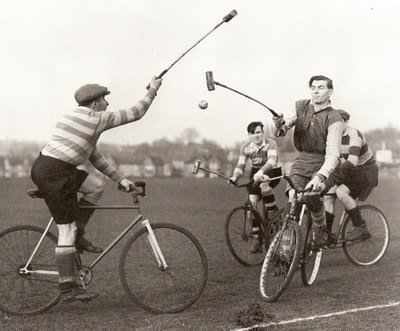 Recently the towns hipster population have started playing bike polo there. During the race Mr Bradley Wiggins-Sir was telling us about a gentleman going by the name of Mr Chris Froom. But jings, don’t let Mr Wiggins-Sir here you call him a gentleman! By the sound of things he was quite the rotter. Apparently he tried to steal a yellow jersey from him when they were holidaying in France. My boss finished in the bunch and the stage was won by a Mr Eli Viviani of Team Sky. Mark CVNDSH of OPQS was second and a huge fellow called Andrew Greipel was third. Previous Previous post: Tour de France Preview. Next Next post: Stage 2. Clitheroe to Colne.